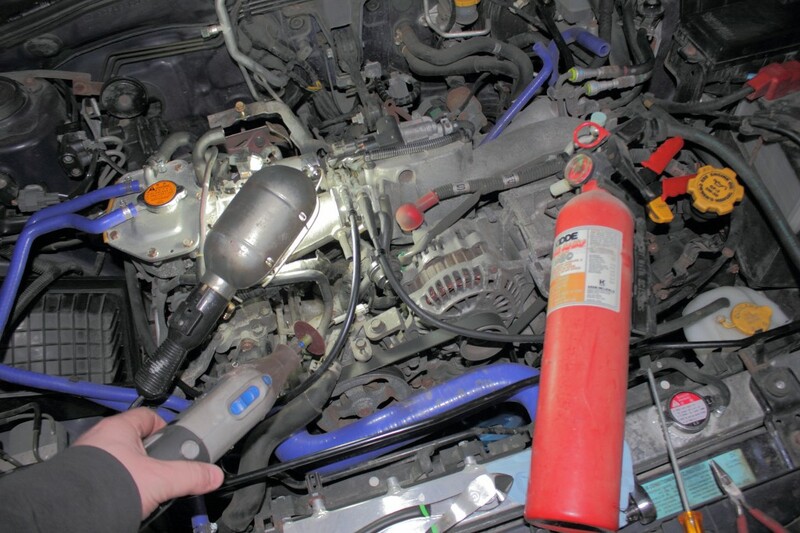 It is common for 02-05 WRXs and some other Subarus have a smell gas in the cabin on cold days. From what I have seen the cut off for what qualifies as cold is about 15 degrees F. Subaru will claim that the line is only leaking vapor and as soon as the car warms up it will go away. I have a Saab 9-2X Aero which is really a 2005 Subaru WRX, and one day when it was -9f I noticed a pool of gas on top of the passenger side of my engine. Clearly there is significant danger when a there is a pool of gas just in-front of the turbo inlet (Exhaust temps hover around 1400 F). Also, on very cold days the leak will not go away (-10f or less). First off you should know that there are some recalls on this issue so be sure to check with your dealer. Most of you will not be so lucky, and Subaru will try to charge you around $500 for the job. The reason the price is so high is because the correct way to fix this problem is to remove the manifold and the air intake pipe to the turbo. It takes about 2.5 hours to fix if you have done it before and have what you need. Subaru sells a fix kit for around $100, but realistically you can get what you need from a local parts store for about $15. Another writeup with pictures can be found on the following forum. 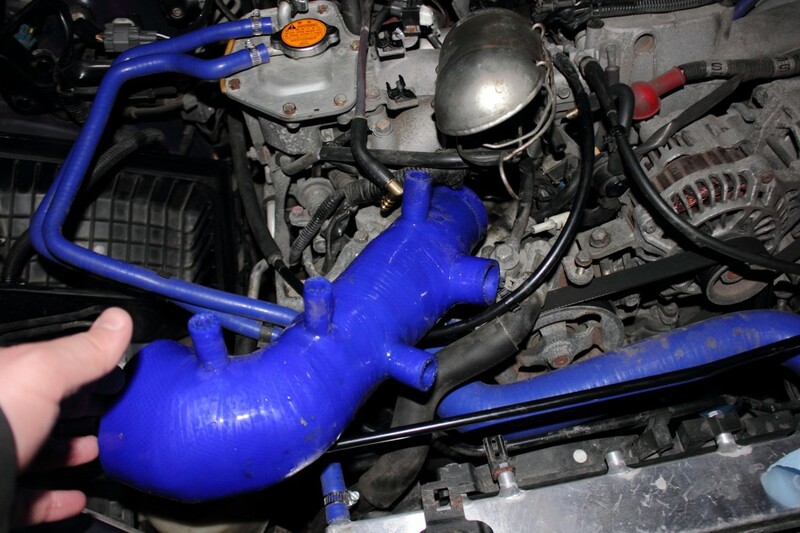 I have an aftermarket silicone air intake so used the method described by the forum, and I managed to complete the job without removing the power steering pump and alternator, but I think I would have had less trouble if I had removed them. If you haven’t working on cars much before this is going to be a very difficult job. If you work on cars a lot this probably won’t be too big of a deal. The way I went about this job was high risk if I failed I would have ended up taking a lot more stuff apart, but luckily it went alright. 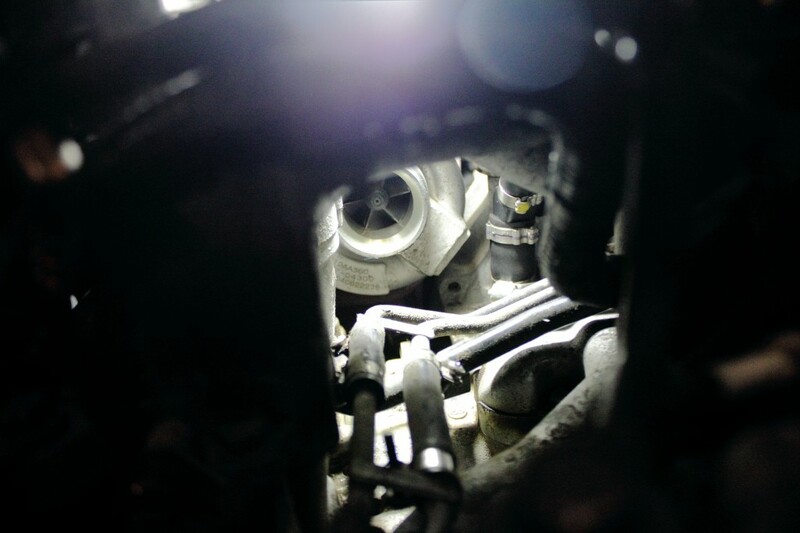 Lets do this… Inlet line out. 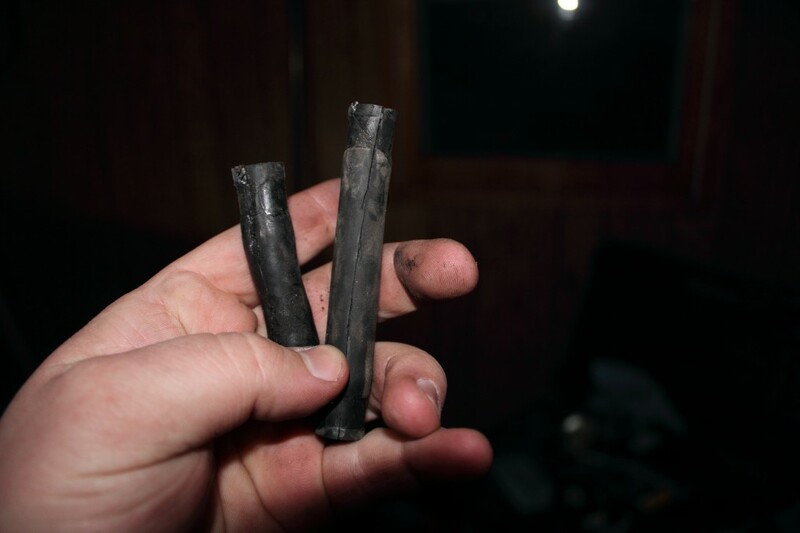 The two rubber portions on the line seen in this picture are what need to be replaced. They will be hard, crusty and probably covered in gas residue. Subaru was also nice enough to put two of the clamps in upside down. Now for one of several sketchy parts. (Don’t try this at home kids.) If you can do this with a snips make sure you do it that way. (I didn’t have anything that fit) I had to use a drummel, but I had a fire extinguisher ready to rock. Car didn’t burn up, and I managed to cut both clamps that were upside down. You will need to carefully cut with a razor blade lengthwise down the hose. This is not easy because it is hard to get your hand in there with the power steering pump in. I’m a fairly big guy and I managed to do it so you will probably be able to do it too. DO NOT cut into the metal portions of the line… You will make a channel and it will leak for sure. You will need some 5/16 inner diameter fuel injection line. 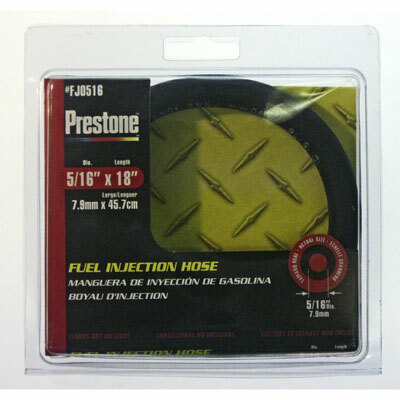 (Make sure you check the actual size in the store sometimes this stuff isn’t exactly sized right) Most automotive stores will have fuel injector hose on the shelf. Make sure you get some fuel injector line clamps. Buy a few extra because they aren’t very strong. I stripped one and got to cut the shorter line off twice. Now I am out of pictures because the fun really starts. Cut your hose slightly longer than the old hose. 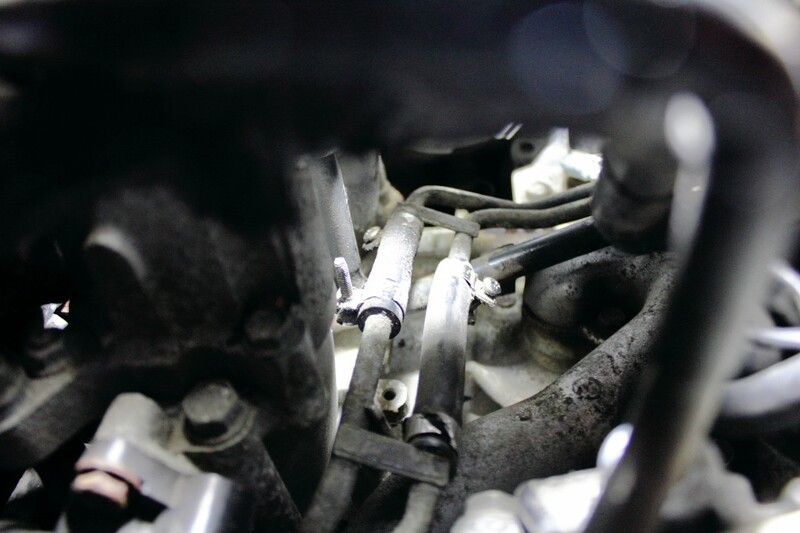 You will need something to carefully pry the injector lines on the back side of the engine out a little to get your new lines on. Because there isn’t much space this will probably take awhile, but it can be done. MAKE SURE your have your clamps on the fuel rail before you start. 🙂 You don’t want to bend them if you don’t have to. Make the hose clamps as tight as possible, but take your time the clamps are not very strong. I actually had another clamp type laying around and because I cut my hose a little extra long I double clamped every line. If you do the same you need to be very careful that the clamps do not interfere with each-other. You are almost more likely to cause a leak using two clamps than one if you are not careful. Actually, this job doesn’t go too bad once you get the the screw it point ignore the pain of cutting up your hands and arms. The inlet line can be very difficult to get on the turbo use rubbing alcohol as a lubricant if you are using a silicone inlet push the edge of the inlet line past the edge of the lip of the turbo. (left side) It will go on, but it can be hard. I think I spent about 7-8 hours, but I was working in the dark in a 20 degree garage so things weren’t going great for me some of the time.